Rustic and classic villa in Javea, on the Costa Blanca, Spain for 12 persons. The villa is situated in a residential beach area, close to restaurants and bars, shops and supermarkets, at 25 m from Playa Cala Blanca, Javea beach and at 0,025 km from Mediterraneo, Javea. The villa has 6 bedrooms and 5 bathrooms, spread over 2 levels. The accommodation offers privacy, a beautiful lawned garden with and a wonderful view of the sea. The vicinity of the beach, places to shop, sports activities, entertainment facilities, places to go out, sights and culture makes this a fine villa to celebrate your holidays with family or friends and even your pets. Javea is an authentic fishing town located at the Costa Blanca on the most easterly point of the Iberian peninsula of Spain. Centrally located 100 km from Valencia (due north) and 90 km from Alicante (due south), Javea is an easy hours drive by car from these historical cities and their airports. The island of Ibiza is a ferry trip away from Denia, another unique coastal town only a short drive through the picturesque mountains. The mountains surrounding this area and the dramatic cliffs along the coastline provide stunning natural beauty, and an ideal place to live or spend the holiday with the variety of residential areas offering many luxury holiday homes, villas and apartments. Apart from the unique location and her typically Spanish charm, Javea is a village on the Costa Blanca that wants to stay a village thanks to the municipal policy. No high buildings, no mass tourism, but pure authenticity. In short, Javea is the place where people live and spend their holidays, who like privacy but also the conviviality and wants to avoid the crowds. The history of Javea (Jávea in Castilian), or Xabia (in Valencian), dates back many centuries. The first evidence of human inhabitation of the area is 16,000 years old, found as wall paintings in the caves of the impressive mountain Montgó. Javea is divided into three different areas: the old town ( El Pueblo ), the port ( El Puerto ) and El Arenal, the area around the sandy beach of Javea, where you can also find most of our holiday apartments. The old town hasn´t changed much over the last centuries and has retained some traditionally built houses, around the typical Spanish squares. The port was built in 1871 with the main trade being raisins. After this trade was no longer in demand, the once large harbour diminished to a small fishing harbour. Later on, thanks to the increasing tourism, the port expanded with a marina suitable for yachts and powerboats. The Arenal is the commercial and tourist part of Javea. Here you can also find many restaurants, pleasant bars and a few discotheques which stay open till late. The beautiful beaches along the 25 km coastline of Javea are mainly gravel and rocky beaches. La Grava and Cala Blanca beaches are excellent for water sports such as jet skiing, windsurfing and canoeing. The small bays Portitxol and Tang with gravel beaches are perfect for diving or snorkeling. The Arenal is the sandy beach of Javea and as well as the bars and restaurants mentioned above, there are also other facilities like playgrounds for children, volleyball nets and also jet skis and boats for hire. Other beaches along the coastline of Javea include: El Pope, Ambolo, La Granadella, Muntanyar and Cala la Sardina. Javea has many beautiful places with stunning views and interesting sights, some of these worth a visit include the two churches: Iglesia de San Bartoleme, built in the 12th century and an example of late gothic architecture. Santa Maria de Loreto was built in 1967 with a very unusual design. The ceiling of this church is shaped as a ships hull, and is dedicated to the patron saint of the fishermen of Javea, The Holy Virgin of Loreto. Soler Blasco, the archaeological museum in the old town of Javea, offers a wealth of information about the areas and Iberian history. There are several amusement parks not far from Jvea, like Terra Mitica , the first real theme park in the Costa Blanca Spain. This amusement park is divided into five areas, five lost civilisations of the Medieval en the main rides take you back to the myths and legends of these ancient cultures. Aqualandia on the other hand is a huge water park where children of every age can have an incredible day in many swimming pools with springboards, rapids, waterfalls and slides. To visit beautiful exotic en marine animals and several shows and other attractions you can visit Safari Park Vergel or animal park Mundomar. Or you can play tennis at one of the tennis courts in Javea. For water sports enthusiasts there are many possibilities, with several places to hire a boat or go sailing to have the most of the Costa Blanca. Or you can dive or go snorkelling with one of the many diving clubs or schools in Javea. El Arenal beach offers jet skis, water skis and boats for hire. The holiday rental homes, luxury holiday rental villas and holiday rental apartments are situated in several urbanisations of Javea, against the forested hills, not far from the sea. - El Tosalet, Toscal en Cap Marti: Stylish built villa parks situated against the bushy slopes of Javea. - Adsubia, la Finca and Cansalades: Situated in the hills between the sandy beach of El Arenal and the golf course. - Partida Mezquida: Spacious and calm residential area located between the old town and the port of Javea. 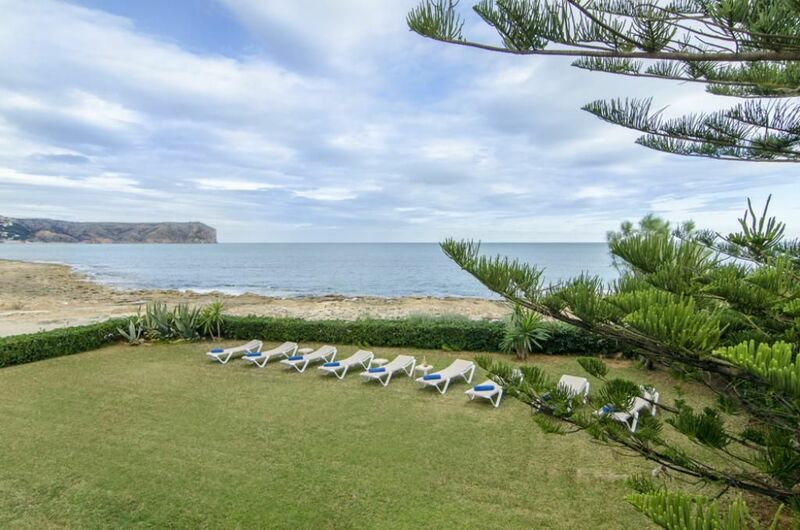 - Costa Nova, Marina and Ambolo: Traditional villa areas with lovely views across the Costa Blanca, the sea and the bay of Javea, situated on the wooded plateau of Cabo la Nao. - Balcón al Mar: Spacious and popular villa park on the forested plateau of Cabo la Nao on the most eastern point of the Iberian peninsula. On a good day (which of course are most!) you can see Ibiza shimmering in the distance. - La Siesta: Quiet villa area situated on the wooded and popular plateau of Cabo la Nao. - Mar Azul and Portichol: These villas are situated in the idyllic bay of Portichol, at walking distance of the gravel beach. - Montgó and La Plana: Extensive residential areas sheltering against the south slope and on the plain part of the Montgó, Javeas elephant mountain. - Lluca, El Rafalet y Tesoro Golf Park and Seniola: Villa parks on the forested hills amidst the orange groves of Javea and close to the Mediterranean Sea. In general all holiday accomodations have their own garden and private pool.